Not only did MJ provide fabulous customer service, our conversation also mirrors what I hope a writing / math / literacy conference looks like in my class. Walk with me through our exchange. I’ve bolded critical moments that we both took as student and as teacher. I've either made the most glorious @KingArthurFlour scones or potentially a disaster. Used almond milk and fresh raspberries in my batter. It was a timely response from MJ, which offers a suggestion with “as long as the dough is not too wet,” as well as encouragement, “nice and tender and light.” Both comments are immediately practical and specific. @KingArthurFlour You have the best Twitter presence. They are soggy. 8 mins to go, though! No fault of the product's, obvi. Finally, as I was typing this post up, surprised that just three tweets could have such a huge impact on my baking experience, I realized the last key to this effective conference was that MJ kept it brief. Where do you find conferring moments in your extracurricular activities? 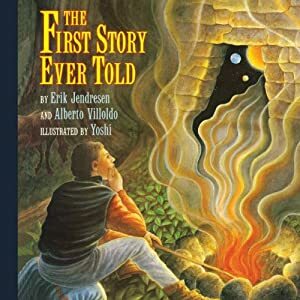 The legend is told as a story within a story, with Grandmother Fire visiting a modern-era explorer in a dream to share with him the first story ever told. The story-within-a-story structure is elegant, but I’ve received feedback from 3rd grade teachers that it’s a lot more effective if you read the book at least twice with students. Anyway, the lesson of the story is basically not to spend your life looking for one mythical place, because what matters most is the journey that you took along the way. The Wildwood third grade team (2012-13) used this book as a mentor text during the launch of Daily 5/CAFE, so you can talk with any of them if you’d like feedback. This summer I undertook an enormous project with an inspirational, equity-focused, growth-mindset colleague. 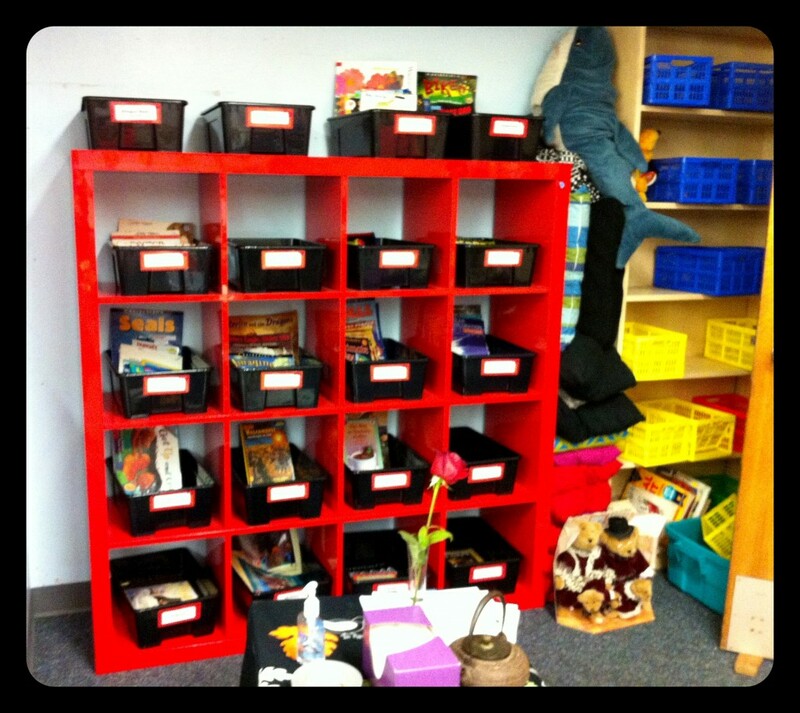 We labeled, organized, catalogued, and PIMPED OUT all the books in her classroom library. I say “all.” When I say “all” I mean “on the way to all.” She has a bazillion books, many acquired from a retired teacher, and we’ve still got a dozen or so boxes that we’re continuing to process. 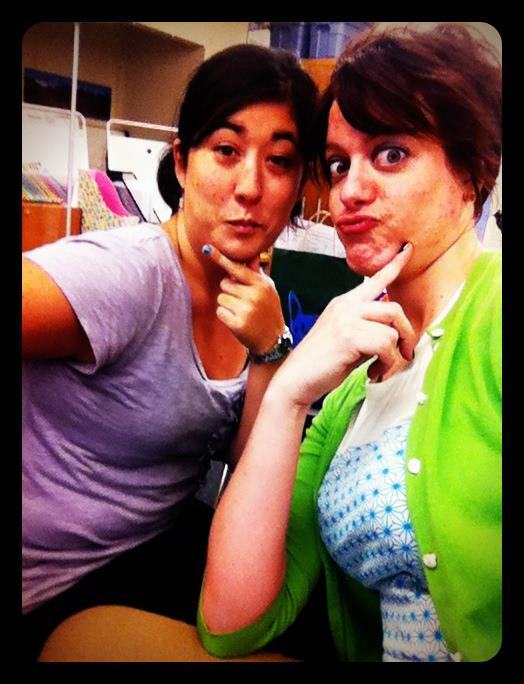 This is me with Ms. Emily Koyama, taking a break from crazy room setup at the end of the summer. Emily inherited a mess of a room, through no fault of its most recent inhabitants (the talented and much-missed Shauna Iseri and Bree Howle). She was hired three days before students came to Wildwood in September 2011 and signed a one-year temporary contract, so she wasn’t really at liberty to clear out the room. So she had books. They were everywhere. And yet nowhere at the same time, because they weren’t effectively getting into kids’ hands. Emily is a strong woman. She isn’t afraid of big change. Or big projects. Or insanity. So this summer, we decided to give her library a makeover. First we needed to know which books were hers. We put her name in every book. All of them. Hundreds of them. We recruited students. We returned missing library books to the school library (oops) and borrowed books to their rightful owners (oops). We had a bajillion piles. Here’s what Emily’s room looked like. Sort of. A visual for the tl;dr crowd. We had an assembly line. 1. Books lived here when they weren’t ready for any of the following steps because they needed their hardcover dust jackets laminated. We’re poor. We didn’t have book covers. So we laminated them. And then taped them on. 2. 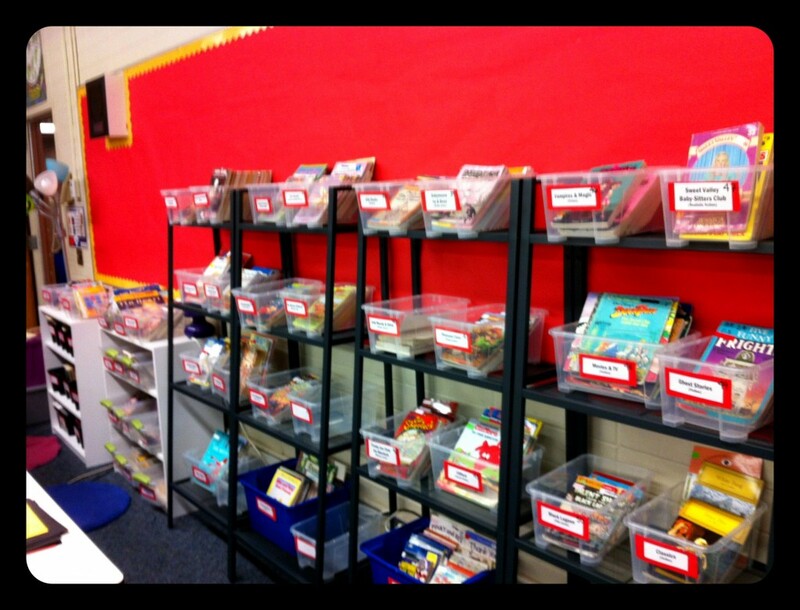 Here were the books that needed old owner’s name crossed out and Ms. Koyama’s name added. Neatly. Legibly. Kids get super excited to help and before long, you can’t read anything. Or spine labels are stuck on the wrong side and the books are taped closed. So, as always, setting expectations and creating exemplars is critical. 3. Books stayed here until one of us could find the AR level. Now. Before you scream at me, Wildwood uses AR. Although I admit that it’s a flawed system, I see NO PROBLEM in giving kids ONE tool to help them zero in on POTENTIAL good-fit books. 4. Books that were already leveled and taped (or didn’t have an AR level) waited here for Emily to enter the ISBNs into Booksource. 5. Books sat on a table off to the side while they waited for AR tape. 6. 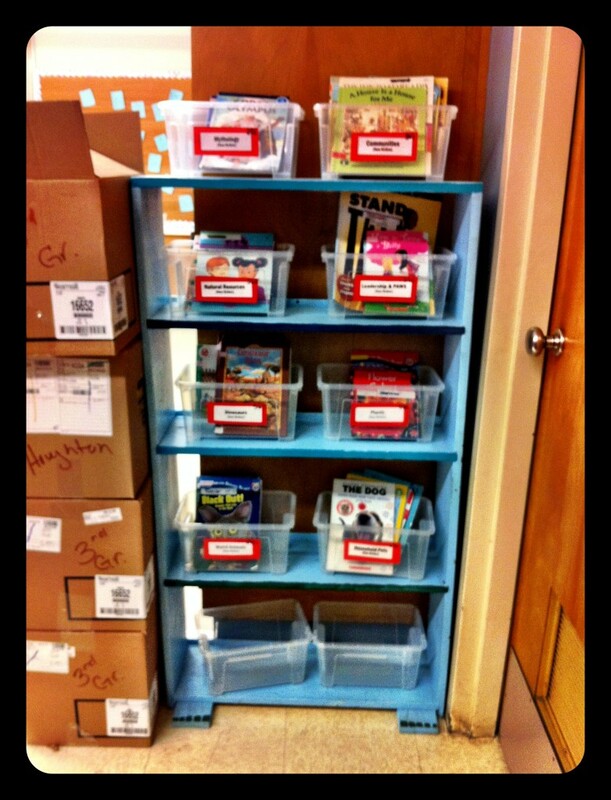 After everything was labeled and catalogued, I sorted the books by genre, series, or author. Finally, we made book basket labels, numbered the backs of the books so they matched their corresponding baskets, and straightened everything up! For a more detailed(!) 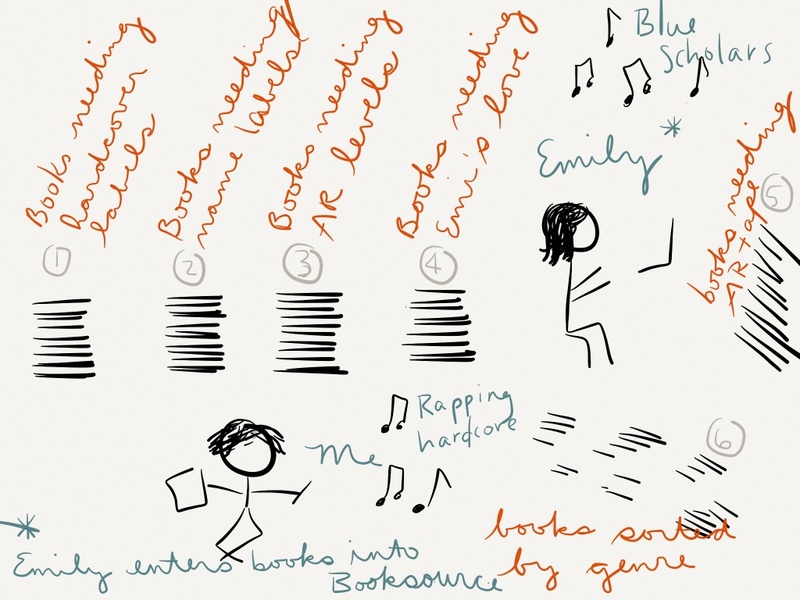 account of setting up a classroom library, check out my sweet five-part series, culminating in a tour. Oh, also, I just rediscovered this tip video for library book sales. Phew. 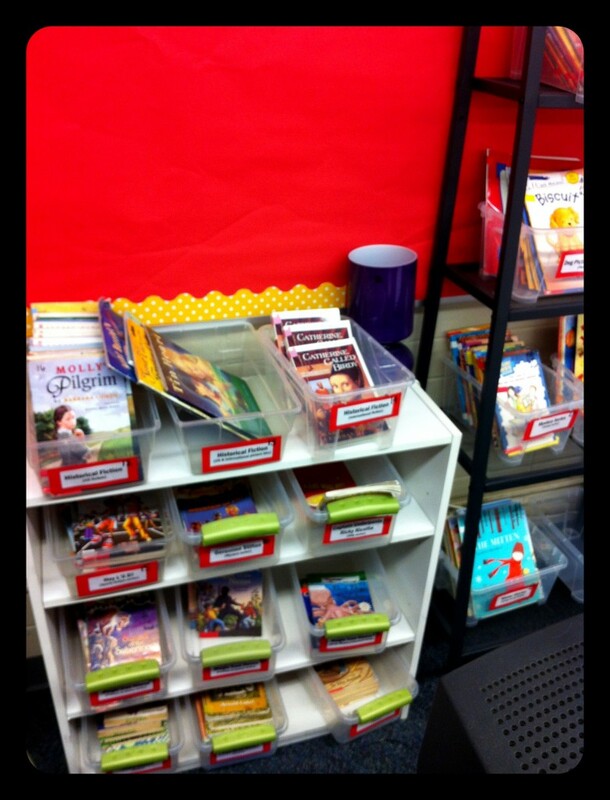 What have you found that works in your classroom library streamlining process? I recently led a mini-PD on reader’s workshop for my district’s new highly capable teachers. I was concerned about making the material relevant for them, as I knew they were already familiar with a five component model of literacy instruction. I also know that personally, when I receive a handout on white paper, it will get lost. If it’s hole punched, that chance is reduced by about 30%. So I try to make sure any information I give out is either on nonstandard-sized paper or is on colored paper. Back when I did SFA, I shamelessly bribed my students into being interested in texts they’d already read 289365 times by making and handing out trading cards related to the books they were studying. So the day before the HCAP training, inspiration struck! 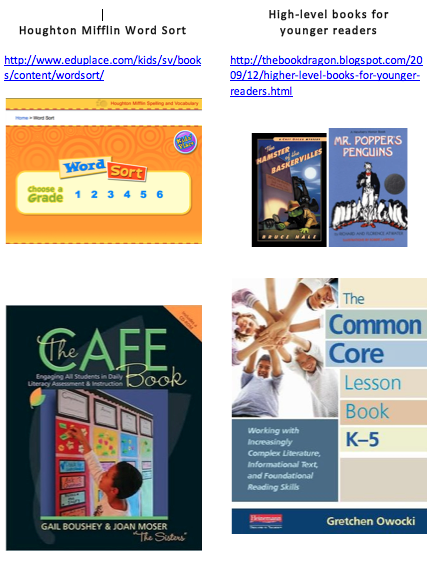 Literacy resource trading cards! They’re not the most beautiful cards ever, but they suited my purposes just fine. I was also able to use them as a mini-assessment when I asked teachers to hold up the card they were most excited about using and a card that didn’t strike them as particularly useful. Let me know if these were helpful! Comments make me smile. Nic Bishop is a brilliant photographer. 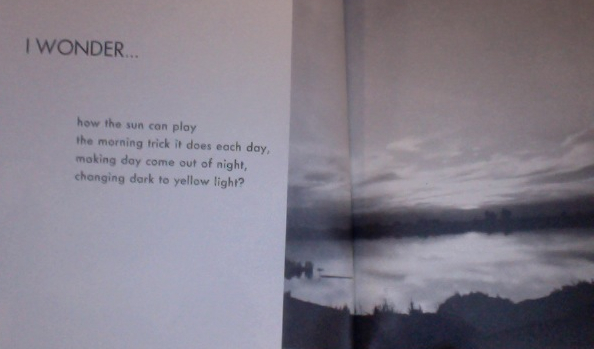 Joy Cowley does a nice job of using pretty basic text to create a quick narrative of a tree frog’s day. There aren’t any text features, but there is a “Did You Know?” section in the back. There’s an !OFFICIAL! FWPS lesson plan around main idea and details included in the bag. It focuses on activating prior knowledge. I love everything Anita Silvey does, and you should definitely check out her Red-Eyed Tree Frog essay. If you yearn for the days of scripted minute-by-minute lesson plans, this might be right for you. Additionally, there’s some extra content available on Houghton Mifflin’s website. Use main idea and supporting details to determine importance. As mentioned above, there’s a pre-designed FWPS lesson plan for this in the book bag. You might also talk about how nonfiction books are sometimes intended to be read out of linear order — for example, reading the Did You Know section at the end of the book first won’t spoil the story like it would if a fiction book were being read. Cross checking… Do the pictures and/or words look right? Does it sound right? Does it make sense? Because the comprehension lesson is about activating prior knowledge, this might be an opportunity to explain a time when cross-checking might NOT work. If a student has never seen or heard the word “katydid,” for example, no matter how many times they look at the text and picture, it won’t magically make sense. Flip the sounds. There’s a point where the frog is stalked by a “hungry boa snake.” If students pronounced the word correctly on the first try, ask how they knew they didn’t need to try flipping the sound first. Explain that as they become better readers with more strategies, the slower, more cumbersome strategies like flipping the sound won’t be as critical for them on a regular basis. Before you get started on anything Jan Brett related, you’ve got to stop whatever you’re doing and go straight to visit Mrs. Eltrich or Mrs. Burn. They’ve put together a pretty fabulous Jan Brett author’s study that might be useful.This book has post-its with open-ended questions attached to several pages to use during reading. This book was originally paired with Caldecott-winning book The Big Snow, but that text hasn’t been added to the mentor text library as of this posting. I’m pretty impressed with the literature guide here. I honestly don’t know that there’s much I can add beyond that! Compare and contrast within and between text. Spoiler alert! Annie’s cat has kittens. In the past, before Bob Barker’s daily reminders to spay and neuter our four-legged friends, this text might have been a great one to make predictions and confirm them at the end. Older students can discuss how the book would be different now that it’s nearly thirty years after it’s been written. Infer and support with evidence. This strategy could be used regardless of whether students predicted Taffy would have kittens or not. If few or no students are familiar with the signs of a cat about to have kittens, it’s a great opportunity for a discussion of how difficult it is to infer if you don’t have much prior knowledge and how important it is to have heightened awareness of the world around us. If students DO pick up on the signs of Taffy’s pending delivery, proceed with a regular inference lesson. Ample easy reading. If students have read this book (perhaps with Mrs. Eltrich or Mrs. Burn! :)), remind them that in a book as complex and detailed as Annie and the Wild Animals, there’s plenty to return to and explore, particularly if they first discovered the book a year or two ago. Ask someone to define the word for you. Mrs. Eltrich has already printed out vocabulary cards for several challenging or uncommon words in the text. Talk with students about how if you know a word is particularly unusual and you don’t anticipate many will know it, you choose to give them the word ahead of time. Wonderopolis. The name pretty much speaks for itself. I Wonder Why… New series on our local NPR station. Predict what will happen, use text to confirm. I notice that often when I make KWL charts with my students, we neglect to follow up on them. (whoops) Consider copying a few of the pages, posting them around the classroom (or the hallway — the photographs are pretty neat), then letting students add answers or new learning as they find them. Use prior knowledge and context to predict and confirm meaning. 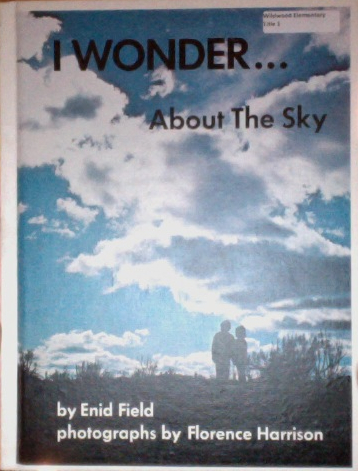 This would be a good book to use early in the weather science unit because it doesn’t have much technical language, and the pictures are pretty supportive of the text. This might then make a good lead-in for Tomie DePaola’s The Cloud Book. Cumulative stories are one of the six main types of predictable books, perfect for early readers. Apparently, “children get comfort from repetition,” although I can’t put my finger on the official research-y studies to back this up. This one offers some insight. I’ve been thinking a lot about cumulative stories. Why they’re so catchy, why they’re so timeless, and why the Caldcott committees seem to ADORE them (Drummer Hoff, House in the Night). This isn’t limited to just their selections of the Caldecott medal winners, as evidenced by this week’s honor book. The Judge follows a pompous counsel as he rejects the excuses and warnings of a creature whose eyes are scary, tail is hairy, etc. etc. Trade a word / guess a word that makes sense. 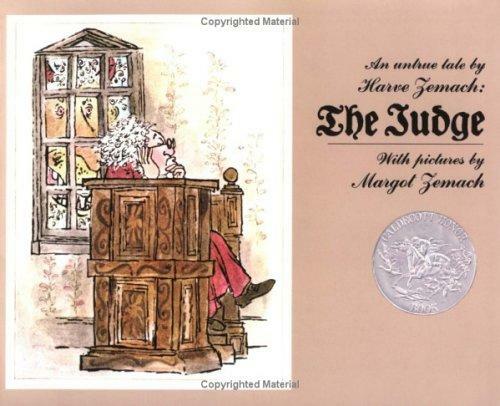 Predictable books like The Judge are great for supporting students’ thoughtful guesses. Here’s an extensive list of other books to try. Practice common sight words and high frequency words. When using Drummer Hoff with my students, I noticed a few of them started to memorize the book and they were no longer actually looking at the words when they reread the text. Write words and phrases from The Judge onto notecards, then let students use the cards to practice individual words, or to create their own interpretation of the judge’s story. Adjust and apply different reading rates to match text. After reading through the book once, have students join in using dramatically different voices for each character. You can see a preview of No Problem on Google Books. Make a picture or mental image. Part of the trouble the characters in No Problem run into is that they’ve never seen the contraption they’re supposed to be building. Talk with students about how they’re being alert in their readerly lives so they can continue to build their schema, which is particularly critical for our students in poverty. Ask questions throughout the reading process. The author and illustrator made some deliberate choices in how they placed text in this book. It reminds me of the way David Wiesner shows movement over three panels in a row. Why did the author/illustrator make these choices? I’ve been thinking that some of the panels make the text look like an instruction manual, but I wonder what students think? Use text features (titles, headings, captions, graphic features). Related to the mini-lesson above, you could discuss the position of text in a fiction book versus a nonfiction piece, such as an instruction manual. 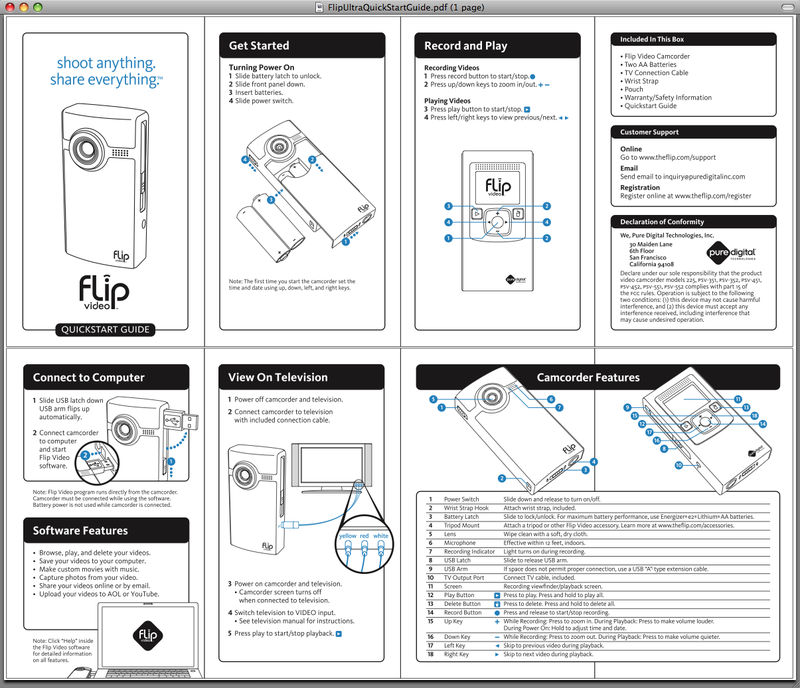 Here’s an excerpt of a Flip Camera instruction guide to use as a comparison. 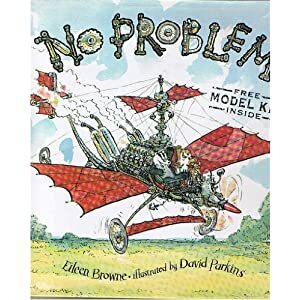 A copy of this is included in the No Problem book bag. Not satisfied with that example? Head over to Manuals Online until you find exactly what you’re looking for.